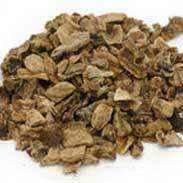 In herbal medicine, it is the tubers of Devil’s claw; surely the most alarmingly named herb in our dispensary! 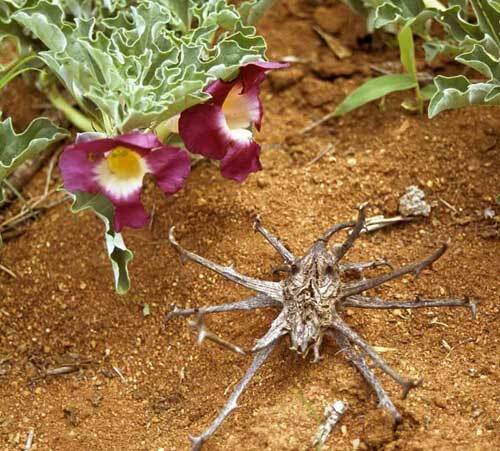 I understand that the name Devil’s claw comes partly from what the thorny fruits of this South African bush look like and partly what it feels like if you stand on it! 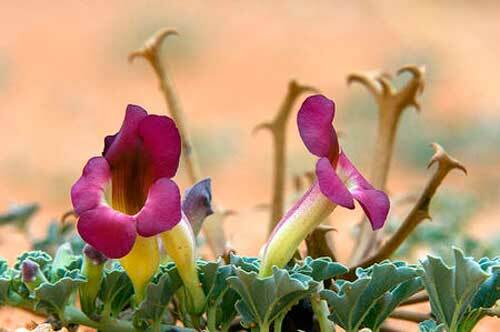 Devil’s claw is highly regarded in herbal medicine as a natural treatment for inflammatory joint and muscle conditions. The stiff, inflammatory joints of arthritis are its most common reason to be used but it has also been widely used for rheumatism, gout, sciatica, lumbago, muscle inflammation (myalgia) and tendonitis. Devil’s claw is also thought to have an action on the liver, and it has been traditionally used for chronic itchy skin conditions and swollen varicose veins. 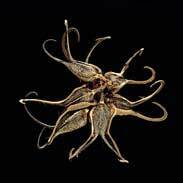 The British Herbal Pharmacopoeia (BHP) describes the actions of Devils' claw as 'anti-inflammatory, antirheumatic, analgesic, sedative, diuretic and says it is indicated for 'rheumatism, arthritis, gout, myalgia, fibrositis & lumbago' and specifically indicated for 'rheumatic disease'. The BHP recommends doses of 0.1-0.25grams or the 25% 1:5 tincture at a dose of 0.5-1ml. Thomas Bartram writes that the actions of Devils' claw include 'anti-inflammatory, antirheumatic, analgesic, liver tonic, cholagogue, diuretic, sedative, detoxicant, stomachic, lymphatic, stimulant, cortisone-like action' He suggests uses for it including inflammatory arthritis, stiff joints, gout, lumbago, sciatica, polymyalgia, neuralgia, liver congestion, gall bladder disorders, itching skin conditions, inflammatory conditions of the veins. Bartram suggests doses of a quarter to half a tsp in each cup of water gently simmered for 15 minutes and then a dose of half a cup, or a 1-2 ml of the tincture. He recommends to avoid it in pregnancy and not to use it in the presence of gastric or duodenal ulcer. ~ Researchers Czygan and Hiller explain that it is used “as an antirheumatic and for supportive treatment of degenerative painful rheumatic disorders'. Clinical reports of its analgesic and anti-arthritic actions have been available since the 1950’s, which have been confirmed through modern studies. "Good therapeutic results have been achieved using Devil’s claw extracts in therapy of degenerative diseases of the musculoskeletal system and degenerative disorders of the locomotor system as well as in the treatment of severe low back pain in placebo-controlled double-blind clinical studies. 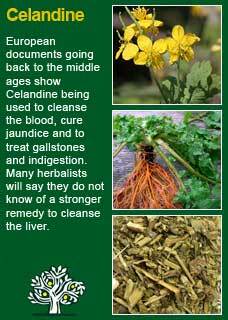 There are no adverse reactions reported in the medical literature and Devil's claw is regarded as generally safe but I and most herbalists would be unlikely to prescribe it during pregnancy or whilst breastfeeding. 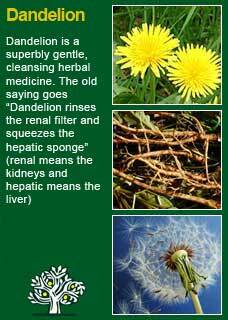 Also, as a herb that has strong effects on the digestive system, this remedy may cause an upset stomach to some individuals when used in high doses and it is recommended to be used with care for people who have a sensitive gut and to be avoided if there is an actively inflamed digestive lining. 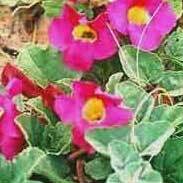 I have much respect for the potency of Devil's claw and have seen that, when it is taken at an adequate dose over a good time frame, that it can help to shift stuck pain and inflammation in the body. Devil's claw is a deep-acting medicine with stimulating, warming and cleansing effects in the body and I have seen many good results when using it for people with chronic inflammatory conditions. 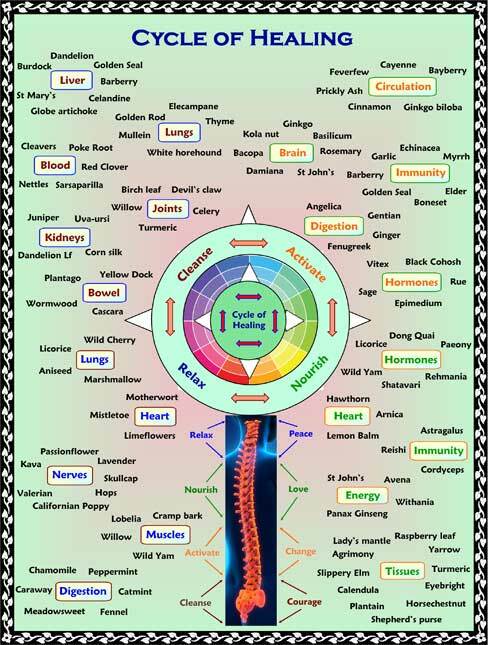 If you who are reading this are studying herbal medicine or if you simply want to understand such a great plant ally at much a deeper level I recommend the old practice of taking a small dose of it and then, with a quiet and attentive mind, observing what you then experience through that remarkable laboratory you have by virtue of simply being born - your own body! Devil's claw has a deep penetrating bitterness which will be a challenge to you if you are not used to such a taste but if you stay with it (i.e. 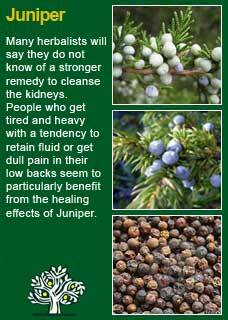 don't rush to eat or drink something) I know you will feel for yourself just how deeply this herb can penetrate into your body. For myself I feel this action like a kind of 'heat-seeking missile!' You can feel exactly how it seeks out heat in the form of stuck inflammation and then starts up a kind of persistent and insistent nudging that says 'go on, get moving'. There is no deeper and more stuck inflammation that a person can get in their body than that which takes up residence in the joints - to take up a healing journey with such a problem that is not merely seeking to mask and suppress the symptoms (i.e. 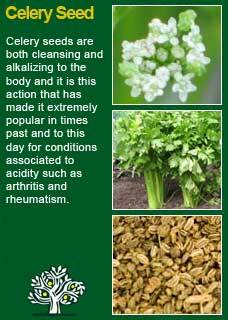 with anti-inflammatory drugs) we need a most powerful ally along the way and this could well be the root of this peculiarly powerful plant. 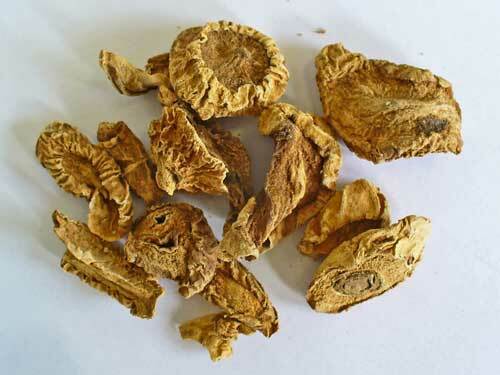 Dosage is always a critical part of the success of herbal medicine and, in the case of Devil's claw, I believe it is not only possible to give too little, which is a common fault of commercial herbal medicine, but also to give too much. Devil's claw is a powerful herb; too much may upset the gut and make the medicine too hard to sustain, but of course too little will not achieve the benefit of the herb either. To make things more complex, too little for one person will be too much for another and vice versa! Rather than put this in the too-hard basket, this is a classic example where knowing a person's constitution can immediately give a helpful template for what kind of dose of Devil's claw will be well tolerated and will work well. This subject, including how to work out what constitution you are, is introduced further at the end of the page. Tigers, hot and damp, can take a lot of it, the kinds of dosages that Weiss is describing at the top of the page in tincture form could be as much as 3 or even 4 mls twice a day, though I would be likely to start at 2 mls, twice a day, to see how they were responding to it. I should also share here that I would be unlikely to use a decoction of Devils; claw because, in treating arthritis etc, one must be prepared for a long journey and it will be orders of magnitude more practical to give a concentrated liquid to use twice a day than to expect the patient to brew up and take as bitter a tasting a decoction as Devils' claw every day for weeks or even months! At the opposite side of the constitutional spectrum is the Elephant/Butterfly constitution, cool and dry, who can also potentially get great benefit from Devil's claw, and may well need it as they age, but I would use a quarter of that dose to start with, i.e. just 1 ml twice a day, or even a little less, for the first few weeks and then only to increase the dose if they felt it wasn't helping. The Bear, cool and damp, and the Eagle, hot and dry, I think sit somewhere in the middle, e.g. 1 to 2 mls twice a day, but if they had any history of digestive troubles or if I thought they only needed some gentle support as their condition was not too advanced, then I would likely start them at 1 ml, twice a day at a time as well. Devils' claw is a powerful herb, the benefit of it will come more by using it at a safe dose over a sustained time frame than by trying to get a quick, drug-like action with a high dose in a hurry. If in doubt, start low and gradually build it up. The right dose is the one that works, more is not better. Devil's claw combines particularly well with Celery seed and Juniper berry for arthritis in specific joints and with Celandine and Dandelion root for conditions that involve rheumatic pains that move around the body. Much of the information here about the traditional uses of Devil's claw is consistent with the model of thinking whereby one may treat problem A with plant B. There is value in this approach, especially in how it helps us pass on useful knowledge to one another, but it falls short in one vital area; and that is that people are not all cut from the same cloth! Something that works brilliantly for one person may do less for another -- why is this?